When I think of Bernie Wrightson, my mind goes back to the Frankenstein novel that he provided art for. The pen and ink drawings are just stunning, and they will always be etched into my mind. I bought this book without know what it's about actually. It can't be too bad if Bernie' Wrightson's name is there. The other guy Steve Niles is a comic book artist and you may know him for 30 Days of Nights among other comic and horror titles. Steve Niles and Bernie Wrightson make a potent combination. This book is a graphic novel collecting three horror stories, namely Dead She Said, The Ghoul and Doc Macabre. It's 176 pages total, and the book's a wonderful over-sized hardcover with a nice textured cover. The publisher is IDW, so reproduction quality is to be expected. Dead She Said is a story about a dead detective trying to find out what happened as he's slowly rotting away. It's a mystery and horror story mixed into one with a hilarious last panel. The Ghoul is a huge gun welding gigantic guy who's helping a local detective solve a mystery that involves devils from hell. Doc Macabre is a scientist who solves supernatural mysteries and this one involves an undead who's an old man without underwear, and more undead. The stories are more horror than creepy and they are great fun to read. The art is just fantastic, the ink work, panel, storytelling and flow are top notch. The black and white suits the mood very well. 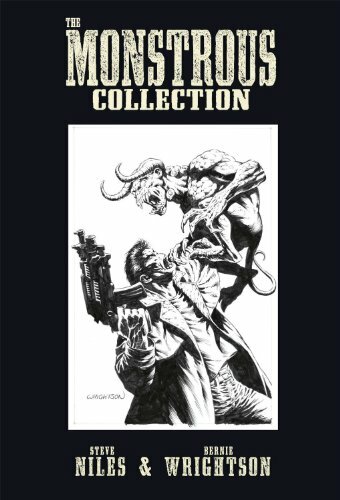 Right at the end is a gallery with more artworks from Bernie Wrightson. Highly recommended for horror readers. Gross. This is starting to get better.